Our commercial roller blinds are easy to operate, long lasting and cost effective. We manufacture our roller blind systems for longevity with components from leading suppliers such as Louvolite, Eclipse, Decora, Yewdale, Arena and many more. Our heavy-duty roller blinds are our most popular system for commercial applications due to the robust components, large widths and easy to operate functions. Our office roller blinds are perfect for privacy and protection from bright sunlight. As a manufacturer, we control how we produce our blinds and the materials that go into them. The little things such as UV resistant thread to sew the pockets and the computerised crush cutting tables we use to avoid fabric fray are only a few of the unseen things that make our blinds last longer than many other systems on the market today. We offer a range of commercial roller blinds to suit every environment. All of our commercial blinds are built to exacting standards with longevity at the forefront of their design. 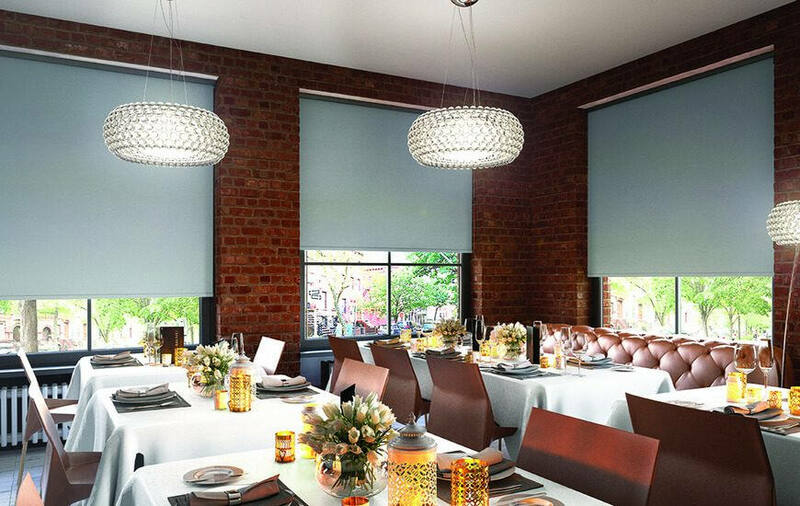 We can provide roller blinds in a wide variety of fabrics, with basic and premium options, as well as the option of dim-out, black-out and sunscreen fabrics. All of our fabrics are flame retardant, and many have special finishes or treatments, making them ideal for specialist environments such as care homes, hospitals, schools and nurseries. Our anti-glare fabrics are perfect for office roller blinds where you need to keep sunlight away from screens. We can combine fabrics in the same office area to give you the right office blind solution in different parts of your working environment. Our office roller blinds with black-out options are perfect for adding privacy to boardrooms and meeting spaces. We have many styles and fabrics to suit schools and universities, hotels and restaurants, care homes and hospitals, public buildings and local authorities. Whatever your business, we can upgrade or replace your blinds to bring a cleaner, fresher feel to your working environment. With such a vast array of products available for your establishment it’s easy to get confused about which type of blind to choose. We’ve been making and fitting commercial blinds for over 30 years so we’ll be able to advise you which blinds are most suitable for your environment. Choosing, specifying and ordering commercial blinds and office roller blinds from Aquarius Blinds couldn’t be easier. Contact us on 0800 953 0199 today to discuss your requirements with our friendly and knowledgeable sales team, or to arrange for a site visit and quotation. We would love to see you at our large showroom in Mitcham, Surrey where you can browse a huge range of window blinds and sun shades in a vast choice of fabric options. It’s a great opportunity to touch, feel and try before you buy. Placing an order with us for commercial blinds is simple, and you will be delighted with our fast turnaround using our project planned manufacturing capabilities. Depending on your specific order, we can offer fast lead times and delivery times of less than a week. All surveying and installation is carried out by our own in-house fitters. As a matter of policy, we do not employ subcontractors for commercial blind installations, believing firmly that our own expert fitting team has the greatest know-how and passion to deliver the best possible results for our customers. Aquarius Blinds invests heavily into training our team of window blind fitters, both in terms of technical knowledge and safety certifications including IPAF, PASMA and CSCS. We are sticklers for detail and we want your commercial roller blinds to fit perfectly.